The arrival of post World War II immigrants has had a profound effect on the nature and diversity of Australian society. This Guide helps to commemorate cultural diversity in NSW by bringing together State archives that document the provision of education to migrants in the latter part of the 20th century. The records listed in this Guide reflect the changing role of government administration in adapting to a new era in immigration. By publishing this Guide we aim to make the records of the NSW Government more accessible to all those who live in, and have contributed to, the cultural growth of NSW. 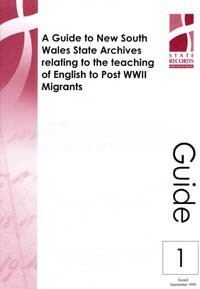 These records date from the arrival of post World War II European migrants to the mid 1980s. This Guide is now available at a special price of $2.00!